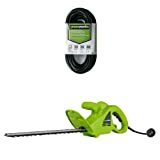 The BLACK+DECKER LHT2436 40-Volt Cordless Hedge Trimmer is the best electric hedge trimmer based on the value it provides. Your garden is precious to you. That’s why it’s important to keep it neat and tidy. And you’ve been doing just that with a handy pair of garden shears. Carefully pruning the hedges in your garden so they come into shape and make your landscape look wonderful. But it’s a lot of work. Work that is tiring, monotonous, and bad for your back. You wish there was a tool that could take care of your hedge trimming needs without requiring so much work. That’s exactly what an electric hedge trimmer can help you with. So let’s take a look at the best electric hedge trimmer available out there so you can make an informed buying decision. What is an electric hedge trimmer? What are the different types of hedge trimmer? Do you need an electric hedge trimmer? A hedge trimmer is a gardening tool that is used to trim hedges and shrubs in a neat and uniform manner. Consider it as a machine to give your shrubs a haircut. Those that are powered by either a battery or utilize a power cord and extension cord to plug into a power source are electric hedge trimmers. Essentially there are two different types of hedge trimmers: gas and electric. Here is a quick comparison of those two types. Gas hedge trimmers are powered by a 2-cycle gasoline engine, much like a chainsaw. They tend to have more power and allow you greater freedom of movement because you don’t have a power cord to deal with. On the downside, gas hedge trimmers require the mixing of 2-cycle fuel and fueling, as well as a lot more maintenance. An electric hedge trimmer is powered either using a power cord that is plugged into an outlet or a rechargeable battery pack. Those using a power cord tend to be a little bit more powerful, but they do not grant you the freedom of movement that a battery charged trimmer allows. However, the battery pack on a battery powered trimmer has to be charged. Both of these types of electric hedge trimmers require less maintenance than their gas-powered cousins. Determining whether you need a gas powered or electric powered hedge trimmer will depend upon some personal preferences as well as how mechanically inclined you are. In addition, those with less work to do and fewer hedges to trim might want to go with a much simpler manual hedge trimmer. You will want an electric hedge trimmer if you are not particularly keen at operating and maintaining a 2-cycle gas engine, which can be a challenge. If your hedges are all fairly close to electrical outlets and can easily be reached using a single extension cord up to 100 ft., then an electric model will work fine. However, if you would rather not deal with a power cord or have hedges in an area that is remote from power outlets, a battery-powered hedge trimmer is a viable alternative. It is likely that you have stayed clear of a gas powered hedge trimmer due to your desire to avoid mechanical and maintenance issues associated with them. However, there are two different types of electric trimmers: corded and cordless. There are pros and cons to each one. Corded trimmers tend to have a little bit more power and that power is sustained for as far and as long as your power cord will reach. A drawback to this type is that you do not have as much freedom to move around and always have to be conscious of the power cord. Cordless trimmers get rid of the necessity of being near an outlet and allow you more freedom to move around without worrying over a power cord. On the other hand, cordless electric trimmers will only run for a limited amount of time before the battery needs recharging. If you go this route, you might want to consider having a second battery on hand so that you can continue working while your first battery is recharging. Because you will be lifting and maneuvering the hedge trimmer in a wide variety of positions, the weight of your hedge trimmer is another important factor to be considered in your choice. Fortunately, electric powered hedge trimmers tend to be fairly light compared to their gas-powered cousins and tend to range between 3 and 8 pounds. Blade and bar length is an important factor to keep in mind as well. Shorter and longer blades each have their pros and cons as well. Shorter blades allow for more precise control of your cutting. Think of them like choking up on a bat to get a more controlled swing. On the other hand, reaching tall or wide hedges with a shorter blade makes your work more difficult and decreases safety while also requiring you to make more passes over the hedge to finish your work. Longer blades allow you to get more done with each cut and allow you to reach without straining or without having to place yourself in precarious positions. Their drawbacks come in the form of having less control and more weight to maneuver while you are working. The power of your hedge trimmer will be measured in either Amps or Volts depending upon whether you are using a corded or cordless hedge trimmer. Corded trimmers tend to range from 2.7 to 4.0 amps of power, which is sufficient for getting the job done, though lower powered ones will overheat if pushed too hard. Cordless trimmers tend to be powered in volts coming in 18, 20, 36 and 40 volt ranges of power. When powering a cordless trimmer the most important factors are battery life, or how long it will last before it loses power, and charging time, or how long it will take for the battery to be fully recharged so it can be used again. The distance between the teeth on the cutting bar is what determines the cutting capacity of a hedge trimmer. Trimmers with a wider distance between the teeth are designed to cut larger branches, while a narrower distance limits the size of the branches that can be cut. However, this can be deceiving as just because there is a wider gap does not mean that the trimmer has adequate power to cut wider branches. Consider finding a balance between power output and cutting capacity to get the best results. Because you are apt to be holding and maneuvering your hedge trimmer for an extended period of time, it is a good idea to pay attention to the design of the handle. It needs to be solidly fixed and have a comfortable feel to it. Trimmers designed with ergonomic handles will have a better feel and will be easier to use and control over a longer period of working. You should get pretty good longevity out of an electric hedge trimmer when compared to a gas powered model. As we mentioned earlier, maintenance on these machines is extremely simple and will help keep it running properly for years to come. However, you will want to be sure that you get a model with a high-quality steel blade which is more apt to hold a sharp cutting edge and consider a brushless motor because they tend to have between 85 and 90 percent efficiency over a brushed motor that ranges between 75 and 80 percent. You enter into a balancing act when you place these two features side by side. In general, higher priced trimmers are of higher quality and will tend to be backed by a longer warranty. The balancing act comes in when considering how extensively your trimmer will be used and how much more wear it will be subject too. If you are going to be pretty rough on your machine a higher priced model with a longer warranty will serve your needs better. If your usage will be relatively light, then a lower priced model will probably last a very long time and warranty really won’t enter into the equation. Be sure that the power source and power cord are always behind you so that you do not risk cutting the cord and giving yourself quite a shock. Make certain that the cord is not in such a configuration that you might trip over it. Whether using a corded, cordless, gas or manual hedge trimmer, protect your eyes by wearing goggles or safety glasses. Debris will fly up from all types of hedge trimmers and can cause damage or injury to the eyes. Avoid reaching in unsafe ways. If you have a tall hedge and have to climb several rungs on a step ladder to reach the top of your hedge, climb down and move the ladder to a new position instead of over-extending your reach and risking serious injury from a fall. Always wear proper clothing. Do not wear loose fitting clothing that can easily be caught in the hedge trimmer blade. Wear long-sleeved shirts and full-length pants when using a hedge trimmer to prevent injury from flying debris. Always wear gloves. Not only will gloves help protect your hands from flying debris, but they will improve your grip on the machine as well. Keep children, pets, and others clear of where you are working to avoid injuries as well. Most users recommend trimming your hedges from bottom to top, keeping the top of the hedge a bit narrower than the bottom so that the lower portion will receive proper light for healthy growth. When trimming the top of the hedge move the blade from left to right and try to keep the blade as level a possible. Do not try to cut too deep, but trim away little by little as the shape of the hedge begins to form naturally. Below is a good video showing how to use an electric hedge trimmer. Various types of hedges will need to be trimmed at different times of the year and in slightly different manners, so knowing the species of the hedge you are trimming is also important for properly trimming your hedge. As we mentioned earlier, one of the advantages to an electric hedge trimmer over a gas powered model is that the electric trimmer requires much less maintenance. In essence, if they are stored properly, they require little more than cleaning with a brush and penetrating oil. Over time, they might also need to be sharpened, but if properly maintained, the lifespan of an electric hedge trimmer is pretty long. Below is a video discussing the simple maintenance involved in maintaining an electric hedge trimmer. The power and durability of a corded hedge trimmer are found in the BLACK+DECKER LHT2436 40-Volt High-Performance Cordless Hedge Trimmer. You’ll pay a higher than a moderate price for this trimmer, but its performance makes it worth the money. This is a powerful cordless trimmer that rivals the overall performance of a corded trimmer but does not tether you to a power cord. The LHT2436 comes powered by a 40V rechargeable lithium-ion battery that will run for approximately 45 minutes and recharge in about an hour. It is a great option if you have other B&D battery powered tools that utilize the same battery pack. 24 inches of bar length make this a good option for being able to get to tough to reach places while you’re working. 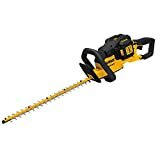 It features a ¾” cutting capacity to cut larger branches and it weighs in at 6.9 pounds, which is relatively light for a battery powered hedge trimmer. There could be some drawbacks to the length of this bar where control is concerned. The wrap-around front handle on this trimmer gives you comfortable control over the trimmer in a wide variety of positions. The soft rubber grip and ergonomic feel of its rear handle make it easy to hold and provides easy access to the controls of the trimmer as well. It comes with pre-hardened, rust-resistant, high-quality steel blades that will hold an edge well. You get the quality of a B&D garden tool built into this trimmer with plenty of durability and the backing of a 2-year warranty. Those who have a lot of heavy-duty hedge trimming to do, but don’t feel like being tied down to a power cord will be thrilled with this hedge trimmer. The longer bar length and battery runtime might be a drawback to some. Users with smaller yards who want more control will want to consider the Greenworks 18-Inch 2.7 Amp Corded Hedge Trimmer 22102. You get a lightweight, easy to control trimmer at a budget price with this trimmer. The 22102 is a corded trimmer with a 2.7 amp motor. It is powerful enough to trim back light growth without overworking its motor, but it is a little underpowered for heavy-duty hedge trimming work. Where this trimmer shines is in that it only weighs 5 pounds and its cutting bar is only 18 inches long providing you with better cutting control. This trimmer has a dual-action cutting blade that reduces vibration, noise and helps provide for cleaner cuts. Its cutting capacity is only 3/8”, which limits the size of branches that you are able to cut using this machine. Durability is certainly built into this smaller trimmer, but only if the user does not push it too hard. It has a single front handle with a handle guard and a rear, grip-molded handle with trigger control operation. Also featured on this trimmer is a cord lock hook feature which helps to prevent the cord from becoming unplugged during use. Its quality is backed by a 4-year warranty. This trimmer is designed for zero carbon output and reduced environmental impact. It is a budget-friendly option that appeals to homeowners with lighter duty hedging. This machine is not a workhorse for heavy-duty hedging and those who need more power and cutting capacity should move on to a different model. Another lightweight option with more power can be found in the Sun Joe HJ22HTE 22-Inch 3.5 Amp Electric Hedge Trimmer. This Joe can be owned for the same budget price as the Greenworks, but it offers a bit more power and cutting capacity. You get a corded hedge trimmer with a 3.5 amp motor in this model. Its added power makes it a little bit more substantial for small to medium-sized yards, but it is still underpowered to really attack a heavy duty hedging job. The cutting bar on this model is 22 inches in length, which is a good even balance between reach and control. The blades are made of pre-hardened, stainless steel for longer wear without corrosion and their cutting capacity is 2/3”, making it a little more substantial, but still limiting it to cutting smaller branches. Lightweight control is still possible with this 5-pound trimmer as well. Sun Joe hedge trimmers feature a wrap-around style front handle, which provides better control in a wider variety of positions. Its rear handle includes a wider, full-length, operating trigger for more comfortable operation and it also features a cord-lock hook to prevent the machine from becoming unplugged. Its quality and durability are backed by a 2-year warranty. Homeowners with small to medium sized yards and moderate-duty hedging work to do will find the Sun Joe to be an easy-to-operate trimmer with plenty of longevity given its budget price. It is somewhat limited on power and cutting capacity, so those who have heavy-duty trimming work to do should look elsewhere. Out the power of a DeWalt cordless hedge trimmer in your hands by investing in the DEWALT DCHT860M1 40V MAX 4.0 Ah Lithium Ion Hedge Trimmer. The higher price on this model might frighten some buyers, but its built-in quality and features make investing in this trimmer justifiable. DeWalt built this cordless trimmer with 40V rechargeable lithium-ion battery power running a 4 amp motor. Its battery life capacity is 2 hours during regular operation and 1 hour if you are doing the heavy-duty trimming. It will recharge in about an hour. Its battery is common among other cordless DeWalt tools you might have, so you probably already have a spare. A drawback to this trimmer’s motor is that it is not a brushless model. The blades on this trimmer are 22 inches long, making them a good balance for control and reach and they are specially designed “hooked-tooth” style blades to assist in reach. The bar is made of pre-hardened, high-quality steel to hold an edge and for added stability. You get a ¾” cutting capacity that is certainly easy for this trimmer to handle. The biggest problem you are going to run into with this trimmer is its 11.9 pounds of weight. Xenoy housing is part of the design of this trimmer making it durable and providing for high-impact resistance. It operates quietly with lower level vibration than some models. Its wrap-around front handle makes it easier to hold onto in a wider variety of positions for better comfort and safer operation. The rear handle on this trimmer has a soft rubber grip for better control and a two finger power trigger. This model comes backed by a 3-year warranty. There are a lot of things to love on this hedge trimmer, which has the freedom of a cordless, but plenty of power to get the job done. If you already own DeWalt cordless tools you will probably be drawn to the quality and value of this trimmer, but those who are on a tight budget are apt to balk at its price. The most balanced and all-around performer of our group of hedge trimmers is found in the Toro 51490 Corded 22-Inch Hedge Trimmer. It is really hard to go wrong with this well-powered affordable trimmer. 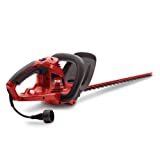 This Toro hedge trimmer comes with a 4 amp powered motor, which is enough power to take care of heavy-duty trimming without overworking its motor. You will get continuous cutting power without having to worry about charging batteries or having a charged spare. However, you will be tethered to a cord. Pre-hardened steel is used in the construction of the blades on this trimmer and they measure 22 inches in length, providing a good balance between reach and control. You have dual-action cutting with this blade as well, providing quieter operation, lower vibration and cleaner cutting. Its cutting capacity is 1/16 of an inch under ¾”, which makes it 2-times the thickness of your thumbnail smaller than the capacity of the DeWalt and B&D models. Where it beats both of them is in its 6.1 pound weight. Ergonomic considerations are taken into account in the construction of the wrap-around front handle as well as its Work Grip rear handle. It features a longer full-grip trigger for added operational comfort and comes with a cord-lock feature to prevent your trimmer from being unplugged while you work. You get the backing of a quality name in lawn and garden tools with this unit as well as a 2-year warranty. In the overall balance of design, performance, and affordability, you can hardly go wrong with this hedge trimmer. If well-maintained, you will be able to get a lot of hours of heavy-duty hedge trimming done without having to make a high initial investment. Where you might feel tied down by this model is in being tethered to a power source. 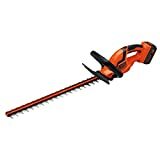 We think the BLACK+DECKER LHT2436 40-Volt Cordless Hedge Trimmer is the best all-around electric hedge trimmer you can get for your garden. The powerful 40-V Lithium-Ion battery along with the 24-inch dual-actions blades is all you need to get your hedges in the best shape. The build quality is good to last you for several years with minimal maintenance required. 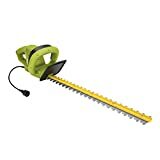 If you are on a small budget and just looking for a hedge trimmer that gets the job done the Greenworks 18-Inch 2.7 Amp Corded Hedge Trimmer 22102 is the right tool for you. It’s inexpensive, lightweight, but gives more than sufficient cutting power for your occasional hedge trimmer needs.